Anti-adhesive (siliconized) film and paper the materials coated with silicone layer. Anti-adhesive materials are produced as one-sided siliconized paper with different densities, and also in the form of PET and PP films with one-sided silicone coat. 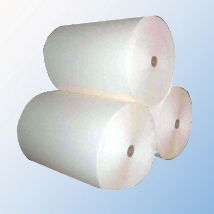 Anti-adhesive film and anti-adhesive paper are designed for usage in the manufacture of self-adhesive materials for various purposes: medical adhesive plasters, one-and two-sided adhesive tapes, sealants, during forming of rubber technical goods and polymer films that are used in packaging of caoutchouc, bitumen, mastic and other materials with a constant adhesive effect. construction - the production of heat- and sound- insulation, as well as in the production of roll mastic, sealants and roofing materials. The samples of our products can be sent upon request.